Has the whole world been frying pickles behind my back and no one bothered to tell me about it? I saw these in a magazine and thought how brilliant, but something tells me this is not a new phenomenon. I love them. They are my new go to way of eating pickles. I think I might even put them on burgers. Or fish sandwiches. Dipped in ranch dressing they are the perfect little bite-sized apps, the ones where you mindlesslydevour ten of them before you know what has happened. Maybe that’s not good. Anyway, whip these out at your next gathering and watch folks swoon. Beat egg, milk and a pinch of cayenne. Place 1/2 cup cornstarch in a shallow dish. 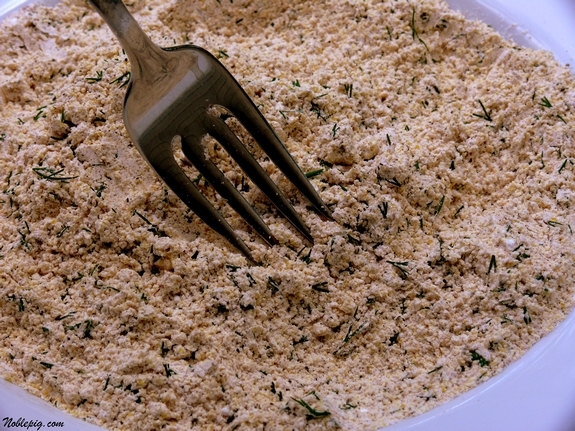 In another dish, mix 1/2 cup each cornstarch and cornmeal with dill, paprika, salt and pepper. Dip cold pickle slices in the plain cornstarch, then the egg wash, then the cornmeal mixture. Fry in 2 inches of 375o F canola oil until golden, about 3 minutes. Drain on paper towels and serve with ranch dressing. I ate way too many of these. Thank goodness my life is filled with lots of hard physical labor to burn off the calories, LOL. One thing I’ve learned my 30 years spent in the south is that it really helps if you pat the pickles dry, refrigerate them for 30 minutes and then deep fry them. I’ve also never used corn starch, just seasoned flour, egg and then a seasoned flour and panko or cornmeal mixture (1:1 panko/cornmeal to flour). But, in the south, fried pickle recipes are as diverse as mashed potato recipes and everyone always has the best one. I’m sure this one is fantastic and I’m going to try the cornstarch on my next batch!! *gasp* only the best coating EVER!! It now, apparently, comes in extra crispy variety!! We’ve been enjoying these in Wisconsin for years, and yes,they’re devilishly good. I purposely don’t own a fryer, as I think I would make things like these WAY too often. I had fried pickles for the first time when I visited friends in the south last year. I thought they would be well, in a word, gross. A pickle that had been fried? But oh, my. I was ever so mistaken. I love fried pickles now! Thanks for this recipe, Cathy. OMG! I love fried pickles! This might be a great food project for this weekend. I don’t know why I’ve never thought of making these since I seem to fry so much anyway… Yum! These sound awesome! I’ve never had them before. Great appetizer, thanks! There is a bar in town that serves these. I love them! I have had an affair going on with these things for quite some time. I too, could eat a dozen without even thinking they are that good. A restaurant (Irish, oddly enough) down the streey from my office serves friend pickles…in their cylindrical form. These look FAR more enticing. Oh I’ve had these with tempura batter but these look SO much better. I love the fresh dill in there, very nice. Perfect to eat while plopping down in front of the tube! Oh, oh, oh! I’ve heard of these, but have never tried them. Gosh, this sounds great! And since the coating doesn’t contain flour, they are gluten free, too! Hurray! This is a must make for me. Bookmarked! I love fried pickles (well pretty much fried anything). Cant wait to try these. Mmm, love fried pickles! There’s one place near me that makes them like this, and all the other places use pickle spears to make them, which I don’t like — too pickle-y for my taste. Love it, will have to try to make my own! ACK! You’re killin’ me! No…it’s my own fault, I come here to see what wonderful & new bit of deliciousness you’ve fixed. This is another recipe that I’m adding to my things to make after I’m done with my fintness challenge. June 8th can’t get here soon enough! This is the kind of savoury kick I crave Cethy! You do make them pop out of the screen! Fabulous!! 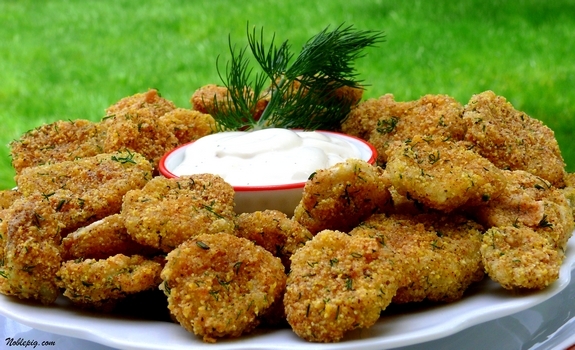 I keep hearing about fried pickles and I have to be honest…I’m just not sure. BUT…being that Meg is coming home for a short visit to finish out her leave with us, before deployment, I have already promised her I’ll make the truly gagful, fried Twinkies…so what’s a few pickles thrown into the mix? I mean, not with the Twinkies…well you know what I mean. LOL. Fried pickles sounded gross to me until I tried them! Now I am hooked. This recipe sounds great! You have to try them. They are fabulous! These have always looked good to me but I have yet to have one. Do you ship? Yes! It’s a Southern thing, no doubt. Very common. I prefer the slices – like you made – than deep-fried spears because with the spears there isn’t enough batter! I know you’ve heard of fried green tomatoes, of course. But try one on your hamburger. So good. I have wondered about these since I heard about them in the movie ‘Sweet Home Alabama’. They look good and I will trust you about how they taste. You can never go wrong with fried pickles! They’re fried. I’m sure I would like them. Ok, went to dinner this week and fried pickles were the appetizer special. Now I must try them myself. Thanks for the recipe. I’ve had fried pickles in restaurants, but I’ve never made them. I love the idea of putting them on a fish sandwich! oh cath! you evil evil woman. I LOVE fried pickles! I mean LOVE. The last time I made these I ate all but 10. How gross eh? Yes, these are quite addictive. wow – I have some friends that would really love these – they sounds and look delicious – Esp. with the ranch dipping sauce! Appreciate the idea. Boy, now you’re talkin’…like this idea better than the tempura style batter. Can’t wait to make ’em. Yummy. I love pickled okra and wonder how pickled okra would taste battered and fried like this. literally ten minutes after seeing this post, I went to a BBQ place in SE Portland and fried pickles were on their menu! Tennessee Reds. I was out with a pickle hater, so I couldn’t try them. I long for a hard physical life wherein food is eaten but then quickly and healthily worked off. 😉 Hope your dry spell lasts until the fences are up and the grapes planted (is that right? – grapes are planted – lol!) — These pickles WILL be made at least once this summer. Do you make your own Ranch dressing? hehe, never tried one, but down here in Texas at our state Fair, you can get fried pickles, snickers, twinkies, and ice cream. I like fried ice cream, but think I would go into sugar shock if I tried a fried snickers. Oh wow, these are yummy looking! I can actually imagine these with bread and butter pickles. Something about the inherent sweetness of the pickle with the crispy crust really sounds good to me. Oh yum! My wife and I first had these up in Bar Harbor, Maine. Delicious with a cold pint of beer. I’m going to have to try this. I might use pickle spears instead of chips. I had fried pickles out somewhere once and now can’t remember where, but yours look delicious! I know that I would eat WAY too many if I made these. I’ll wait for our next party so I have some help eating them! If it makes you feel any better, I have heard of fried, but never eaten them. No one makes them in my neck of the woods. I think someone had better start doing that – I suppose it will have to be me. Never knew they were fried in cornmeal. I’m in love! I just had them for the first time in Feb, served with a lobster roll, I am now an addict! I can still remember my first fried pickles many years ago. It was at a Cajun restaurant in Denver. I’ve been ordering them ever since but never finding quite the right mix of pickle and breading to suit my taste. I specifically dragged, er took, my husband to Hooters once to try their fried pickles. Pickles not so good but my husband enjoyed the adventure. Will definitely try this! I LOVE YOU. I love fried pickles and haven’t had in years since gluten free. I can’t wait to make these. THANKS, OH THANKS, AND JUST SO YOU KNOW, THANKS FOR THESE. OMG! Those pickles look amazing! I had some at a restaurant ONCE and have never had them again because I can’t find them anywhere! I guess I’ll have to make them myself! Frying foods freaks me out though (the hot oil part), any advice! Nope, not here. Never heard of them. So don’t feel alone. But you have definitely peaked my curiosity! Good grief, seriously this looks evil. But delicious…. I don’t even like pickles, and I LOVE LOVE LOVE deep fries pickles! I live in Canada and they’re pretty common as an appetizer at restaurants here (especially at bars). My favourite is when they’re sliced lengthwise (like wedges). Oh jeez I may need to run out and order some of these! 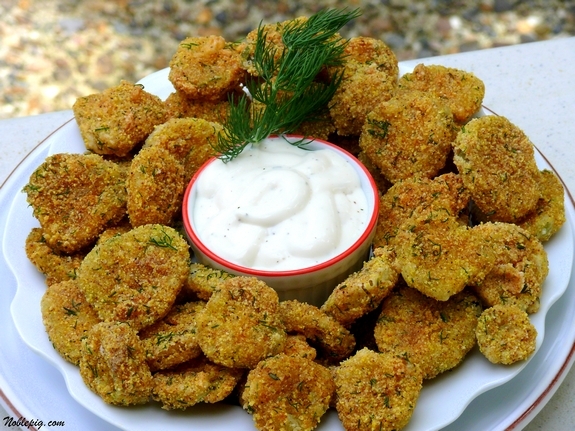 i love fried pickles but have never made them. i really want to try this recipe but i dont have a fryer. do you think i could make these in a dutch oven? You never need a fryer in order to deep fry! 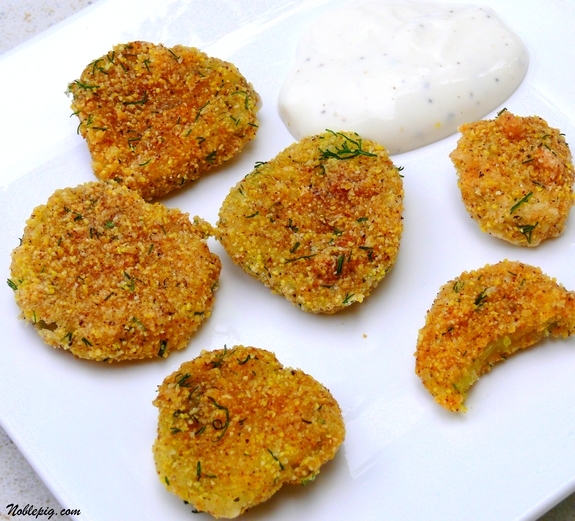 Is it possible to modify this recipe and bake the “fried” pickles in order to keep it on the healthy side??? Just curious. Oh boy, am I ever looking forward to trying these. Boyfriend hates ranch though, so I might try some alternatives. Maybe some basil mayo and/or sriracha. Pickles are one of my all time favorite foods and frying them – these have my name all over them!!! Can’t wait to hear how you liked it! FRIED PICKLES— IT’S WHATS FOR DINNER. I’m so glad they are gluten free! Can you make these with Cream Cheese, have had deepfried pickles with Cream cheese and then breaded and ried but not sure how to make them? I have not, but I think they would be great.